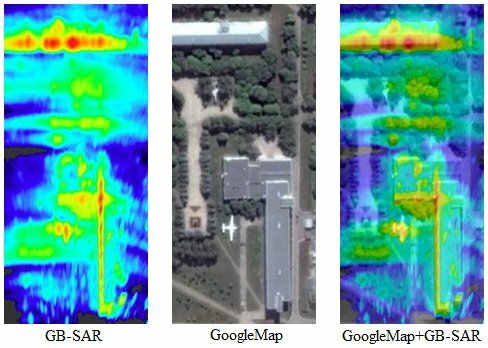 An experimental ground-based synthetic aperture radar (GB-SAR) system operating at Ka-band has been developed. The radar system is designed to be operated from a top of a hill or from a roof of a building etc. for imaging of the underlying ground terrain. Fig. 1. GB-SAR, GoogleMap, and merged GoogleMap+GB-SAR images of the scene. © 2013 IRA NASU. All rights reserved.